$43.99 & FREE Shipping on orders over $59. In 2011, the White House home brewed beer for the first time in, well, perhaps centuries! We were super were excited when a MoreBeer! customer first submitted his freedom of information act request for the White House homebrew recipes. We were a little surprised, and we'll say it - let down - when we saw the actual recipes. 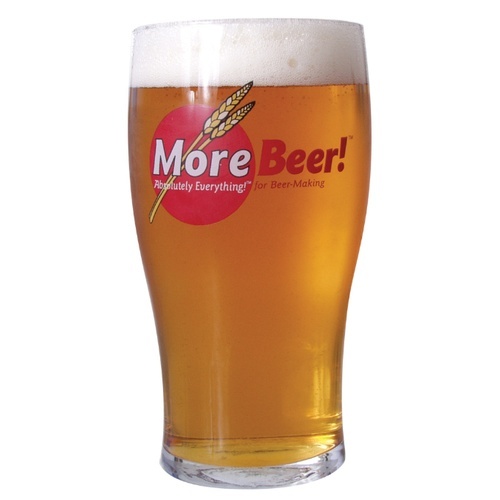 One MoreBeer! staffer blurted out "Whoa...this seems like beer that Prince Harry should be brewing." 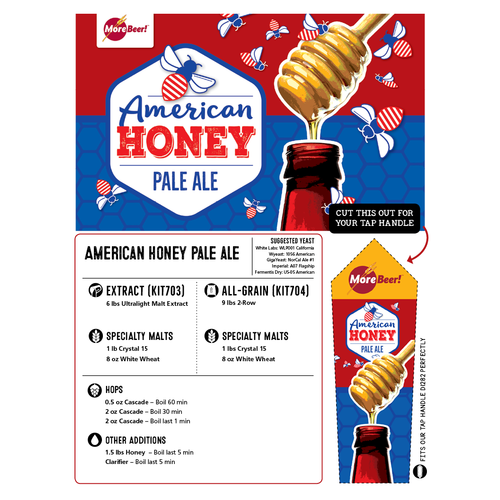 English malt extract, English hops, and even an English yeast strain were used; so the only thing truly American was the honey! It seems that we were not the only beer lovers to pick up on this. So while we really, really love English beers as much as the next homebrewer, we think the White House Brewmasters should be using fresh ingredients from well...America. Since we were tweaking the recipe towards this side of the pond, we decided we could also help educate the White House staff on their yeast selection. Yes dry yeast has gotten better but since this is the White House and all, we think they can spring for liquid yeast...and is there any better choice for this recipe than Wyeast 1056 AMERICAN Ale or White Labs 001 California Ale?? Not really. In fact, just queue up the star spangled banner, turn on the football game, and throw some hot dogs on the grill because we are starting to feel pretty patriotic here. So while we send this kit along with our friendly suggestions back to the White House, YOU can make the exact same beer at home. 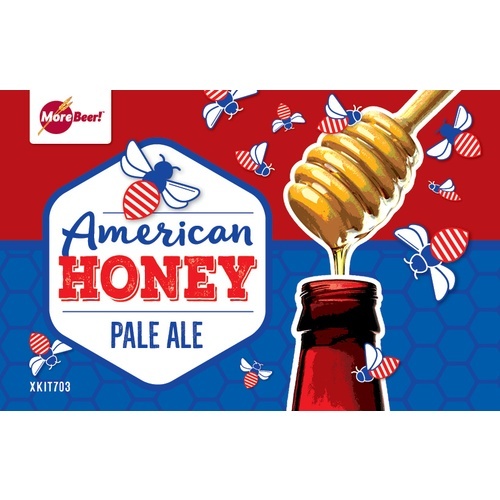 That way if you are in a diner somewhere on the campaign trail and the president pulls up you can whip out a bottle of the 'Honey Pale the White House Should Be Making' or the 'Honey Porter the White House Should Be Making' and enlighten the Top Dog, homebrewer style. Truly a classic American Pale Ale recipe! This ale will deliver a smooth blend of Cascade floral character and biterness, tempered by a slight sweetness from the honey. The California Wildflower Honey delivers just enough residual sweetness to result in an amazingly balanced, hoppily delicious pale ale. 21st MoreBeer batch. Looking for variety within IPAs and Pale Ales. Does this kit not come with yeast? BEST ANSWER: Very few kits come with the yeast included! The vast majority require you to make a yeast choice (recommended "popping" for the liquid yeast). No. You should pick up some white labs California ale yeast. I followed the recipe except to add the zest of two fresh limes the lat 2 minutes of the boil. Then the juice of those limes before I chilled the wort. RESULTS a full bodies honey ale with a little twangy tart on the back. Nice and refreshing. I brewed this once and it was fantastic. It has the right balance of hops and the honey gives it a nice finish! I will be ordering again very soon. This was a beer that everyone liked and 5 gal didn't last long. It is balanced well and it doesn't taste super sweet. This will be one of my regular beers on tap. I wanted a Pale Ale with a more balanced flavor than I get with an IPA. This one brings great hops aroma (I really enjoy cascade) but doesn't bowl you over with residual bitterness. The honey flavor is very subtle--not at all sweet. It was more noticeable after it had been in the bottle for a few weeks (and it was a struggle to make it last that long). Definitely improves over time as it mellows. I'm new to home brewing, so I kept it simple and didn't make any modifications to this recipe (yeast: White Labs CA Ale). I have brewed from this kit twice and the second batch is very consistent with the first. Highly recommend! I tried the Honey Pale Ale for fun, and now it's a go-to brew. The malt is still there, but the honey keeps it in check. I dry hop with even more cascades, and it ends up a light, hoppy blast of a pale ale. Brews clean, hits the numbers right on. Go for it. I don't buy kits often, but this one caught my interest. I just wanted to make something sweet for the ladies! It is one of our favorites. We have made it three times in a year and the keg never lasts a week. I had never brewed a beer that used honey, so I was a little nervous, but this turned out to be a great beer! It has a sweetness to it, but it's not overpowering. I prefer a beer that's not very bitter, but still hoppy. This one fit the bill perfectly. I kegged mine straight from the primary after 2 weeeks. Good head retention, color, and aroma. A very pleasant beer. I knew from the taste at bottling that this was going to be a great beer. It surpassed even those lofty expectations! This beer was the best I have made in 2013, one of 6 batches since February. I am including this in my pipeline at all times. In fact I have drank about half (or donated to friends) of my original supply so I need to order this ASAP!! No doubt, you will love this product. I was impressed beyond belief! Overall a nice beer. Good balance between the sweetness of the honey and the bitterness of the hops. If you enjoy a beer with Cascade hops but not with a bitter bite, then you have got to try this beer. At first I wasn't sure but after some time in the bottle, this is a really great beer. Not sweet at all, but he honey flavor comes thru on the finish. Hop flavor was strong but has evened out after 3 weeks in the bottle. I highly recommend this beer kit. Hands down, this is the best Pale Ale I've gotten my hands on (or brewed). The hops blended unbelievably well with the honey, giving the ale a smooth hoppy kick without the typical bitter cascade primary flavors. I honestly can't think of any ways to make this better than it already is. I used a gram of fermaid-k 3 days into the primary ferment and biofine clear in the secondary. Force carbonated at 14.9 psi for a week. This will for sure become one of my house flavors. Wanted to give this one a whirl after reading about the White House's own version. FIrst impression is that the beer is very sweet, almost like a mead. The cascade hops and honey interact in an interesting way that is refreshing and herbal. Not bitter at all, though sometimes it tastes a bit medicine-y. I'm not the biggest cascade fan, but friends who like Sierra Nevada beers seem to find this delicious. Definitely worth tasting.